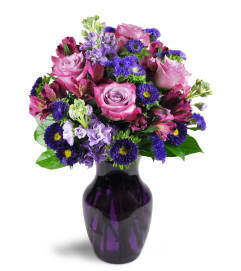 Floral Insight proudly presents the Sense of Wonder Bouquet by Better Homes and Gardens. 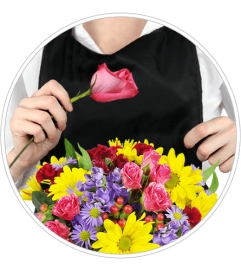 Boasting a truly charming collection of blooms that is set to surprise and delight your special recipient, this fresh flower arrangement has a light and airy look to it that is set to capture their hearts and imagination. 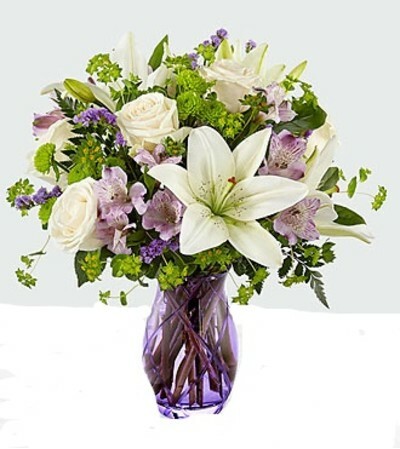 Cream roses, mingle with lavender Peruvian Lilies, showy and fragrant white Asiatic Lilies, green button poms, lavender statice, bupleurum, and lush greens to create an inviting springtime look. 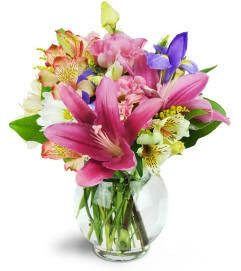 Presented in a stylish lavender glass vase to give this flower bouquet an extra pop of color, this arrangement looks like it's been taken straight from the pages of Better Homes and Gardens® to create that perfect Mother's Day, thank you, or happy birthday gift.